On the popular Beach Road, Holiday Inn Pattaya features spacious rooms with floor-to-ceiling windows and a private balcony overlooking the sea. The hotel has 5 dining options, 3 outdoor landscaped pools and a fitness center. Holiday Inn is a 90 minute drive from Suvarnabhumi International Airport. The Sanctuary of Truth, Pattaya is 2.5 miles from the hotel. Air-conditioned rooms at Holiday Inn come with a flat-screen TV with cable channels and a private bathroom with a hairdryer. A minibar and a tea/coffee maker are provided. Room service is available. Guests can relax in the sauna or go for a massage at Tea Tree Spa. Other facilities include a Kids’ Club and a business center. Free Wi-Fi is available in the hotel’s public areas. Cafe G offers all-day dining, while Terazzo serves Italian dishes. In addition to The Flow deli, which offers light meals and coffee, there is also a lounge and a pool bar. Hotel Rooms: 367, Hotel Chain: Holiday Inn Hotels & Resorts. Book now on Booking.com ! On a quiet beach stretch along Pattaya Bay, Dusit Thani Pattaya offers sweeping views of the sea. It features 3 restaurants and 2 swimming pools. Guests enjoy free parking. 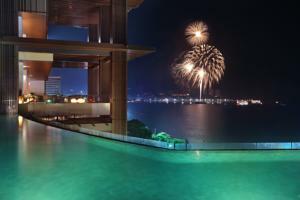 Dusit Thani Pattaya is 4 miles from the Elephant Village and 6 miles from the Floating Market. Bangkok City is a 1.5 hour drive from the hotel. All rooms at Dusit Thani have private balconies with either garden or sea views. Rooms feature modern Thai décor, and provide a TV with cable channels. Recreation choices include playing a game of tennis or enjoying a massage at the spa. 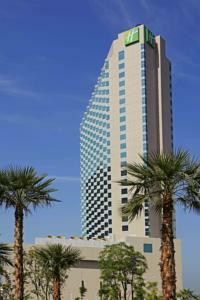 The hotel offers currency exchange services, while day trips can be arranged at the tour desk. Guests can sample a wide variety of local and international dishes at Cascade Restaurant. The Bay Italian Restaurant serves Italian dishes and offers views of Pattaya Bay. Hotel Rooms: 457, Hotel Chain: Dusit Hotels & Resorts. Hilton Pattaya offers 5-star luxury with 180-degree view of Pattaya Beach and 37-inch flat-screen TVs, atop CentralFestival Pattaya Beach Complex. It features an infinity pool, fitness center and spa. 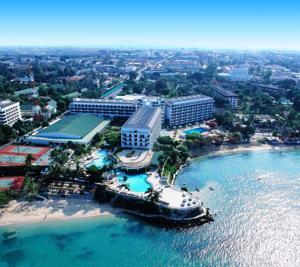 Pattaya Hilton offers direct access to the 300 shopping and dining options housed within the beach complex. It is a 1.5-hour drive from Suvarnabhumi International Airport. Featuring light hardwood floors and calming pastels, spacious rooms provide a relaxing environment with a comfortable sitting area and private balcony. Private bathrooms have premium toiletries, a rain shower and a separate bathtub. Guests are spoiled for choice with the variety of water sports and outdoor activities offered. Start the day with a hearty breakfast at Edge restaurant, which offers international dishes, an open kitchen and breathtaking bay views. Other dining highlights include fine dining at Flare and light refreshments at Drift. Beverages and delectable dishes can be enjoyed at Horizon, on the roof top of the hotel. Hotel Rooms: 302, Hotel Chain: Hilton Hotels & Resorts.